I opened my first shop on Etsy, November 5, 2006. At the beginning, I was just selling toys I had knit, not patterns. Those only came when other knitters saw my toys, and wanted to knit some themselves. It's been a crazy, fun adventure of yarn and cuteness since that day! Sometimes I miss knitting toys for my shop. I'm so busy designing now, I can only manage to make extra toys for family and friends. One of the first toys I made for my Etsy shop. My designs have changed a bit since then! 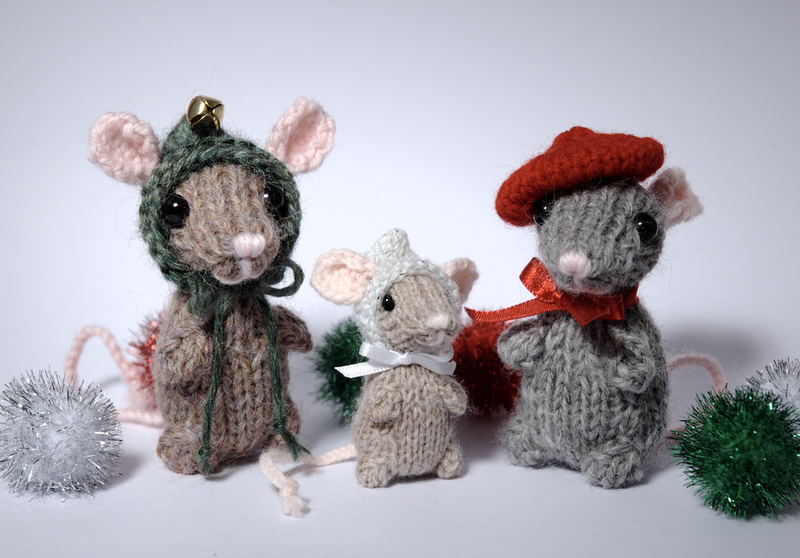 For my final give-away contest, in honour of those first toys I knit, you could win a pair of Holiday Mice! The winner will be free to choose the colour of the mice, and the style and colour of the hats. You could even ask for a wee Santa Mouse, like this one by the Yarn Harlot (I'm still blushing a bit over that). I will pick the closest yarn I can from my stash. Hopefully, I will have them done and off to the winner in time for winter holidays! Holiday Mice: what colours would you choose? If you would like a chance to win this prize, please leave a comment below, with a way of contacting you (email, Ravelry name, etc. I've been asking for this because usually Blogger does not give me this information when you leave a comment). I will do my best to ship to anywhere in the world. I will draw a random winner on November 15. Best of luck, and thanks for visiting me this week! Posted by Barbara Prime at 9:45 a.m. I had the mouse on my mental queue since last month's creepy crawly critter along, you have the most adorable patterns! I hope the yarn Harlot bump helps you out!!! November 5, 2016 at 10:13 a.m.
November 5, 2016 at 10:20 a.m.
November 5, 2016 at 10:50 a.m. I was turned on to your patterns by the Yarn Harlot (thank you, Stephanie! ), and you do amazing things. I would love-love-love to be the recipient of mice made by your very own hands! November 5, 2016 at 10:58 a.m. These mice are just too cute but so are your other patterns!!! I have a collection of plush mousies and would love to add to it. November 5, 2016 at 11:12 a.m. So cute! Thank you for the opportunity to have something hand knit from the designer! November 5, 2016 at 11:16 a.m.
November 5, 2016 at 11:17 a.m.
November 5, 2016 at 11:22 a.m. Your knitted critters are beyond cute. I know a little kitty who thinks so too! Hugs and happy holidays from Kimmy (KimmyZ on Ravelry). November 5, 2016 at 12:07 p.m.
Oh, wow, I think this is the best prize of them all. I would love a pair of holiday mice made by you. I love your designs and it would really make my day if I was to win. Thank you for this lovely gift. November 5, 2016 at 12:42 p.m. They are absolutely adorable! I'm twinglemom on Ravelry. Not sure if I'm clever enough to make them, but if I won, I'd offer a nice cozy home! November 5, 2016 at 1:56 p.m. Adorable!! Thanks for the free pattern. I'm larochelle on ravelry. November 5, 2016 at 2:25 p.m.
November 5, 2016 at 6:14 p.m.
What a great looking mouse family! November 5, 2016 at 7:07 p.m.
November 5, 2016 at 8:44 p.m.
November 5, 2016 at 10:13 p.m. These are super cute! :) I'm sarahbethknits on Ravelry. November 5, 2016 at 11:09 p.m.
November 5, 2016 at 11:15 p.m. These mice are so incredibly cute. I am "Andersson" on ravelry. November 6, 2016 at 8:35 a.m.
November 6, 2016 at 12:05 p.m. I can't think of anything that I would rather win than knitted mice! November 6, 2016 at 6:51 p.m. I love these mice! My rav ID is missmae07. November 6, 2016 at 9:05 p.m.
November 6, 2016 at 10:36 p.m.
November 6, 2016 at 11:13 p.m.
November 7, 2016 at 7:19 a.m. I saw these on the yarn Harlot blog. They are adorable! November 7, 2016 at 9:49 a.m.
November 7, 2016 at 11:51 a.m.
November 7, 2016 at 3:09 p.m.
November 7, 2016 at 3:33 p.m.
November 7, 2016 at 9:32 p.m. I've been wanting to knit some of your toys for ages. The designs are just adorable. I might need to make one soon for a friend's little boy to be. Maybe a kitty or a bunny... You have a real gift for designing animals that look both friendly and doll-like but still keep the character of the real creature from nature. November 7, 2016 at 11:35 p.m. I love those mice. I just found them via the Yarn Harlot but they are definitely in my queue now. I can't wait to knit them. November 8, 2016 at 8:31 a.m.
November 8, 2016 at 1:53 p.m.
November 8, 2016 at 2:25 p.m. 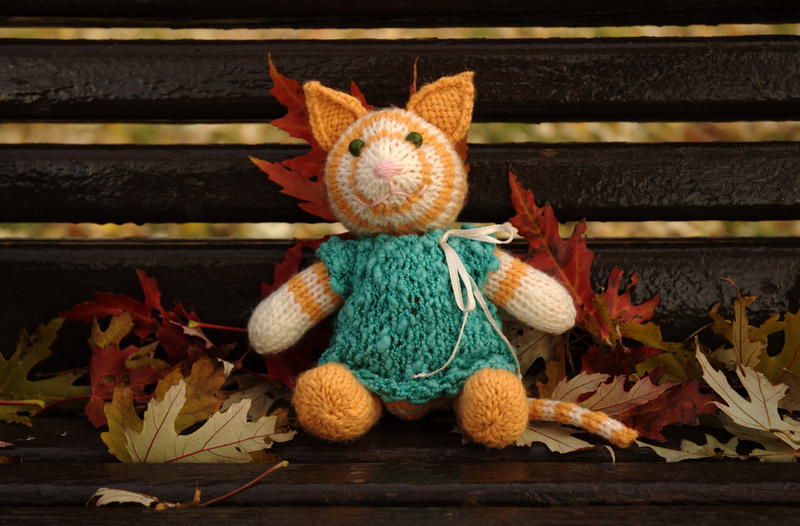 The only thing better than knitting your patterns would be getting one YOU knit! :) And I apologize for not being around in the group as much this year, but sometimes life happens. November 8, 2016 at 3:24 p.m.
November 8, 2016 at 5:36 p.m.
November 8, 2016 at 11:50 p.m.
November 9, 2016 at 12:29 a.m. I can be found on Rav CastOnCalamity. November 9, 2016 at 6:21 a.m.
November 9, 2016 at 9:00 a.m.
November 9, 2016 at 9:22 a.m. I love your patterns! They always knit up so well and the instructions are clear and easy to follow. I knitted your bunny dressed in a little blue jacket and he is now the beloved bedtime companion of my 10 year old and I knit him way back when she was a baby girl! My Ravelry name is Malinky. November 10, 2016 at 1:09 p.m.
Those wee mice are adorable. Would love to win. November 12, 2016 at 10:12 p.m. I'd love to win! I'm elemjay on Ravelry. November 13, 2016 at 8:25 a.m.
November 13, 2016 at 2:55 p.m.
Love all your patterns! I've made many of them; the mice, lamb, and mini aliens were my first stuffed creations. They were so much fun, and such a hit! November 13, 2016 at 4:24 p.m.
November 13, 2016 at 5:49 p.m. I love your animals so much! November 13, 2016 at 7:12 p.m. Thank you for the opportunity to win the mice. November 13, 2016 at 7:13 p.m.
November 13, 2016 at 10:29 p.m.
You are so creative! I would be so happy to win! November 14, 2016 at 12:00 a.m.
November 14, 2016 at 6:03 a.m.
November 14, 2016 at 10:09 p.m.